It may be October, but Summer is still in full swing in the Bay Area. 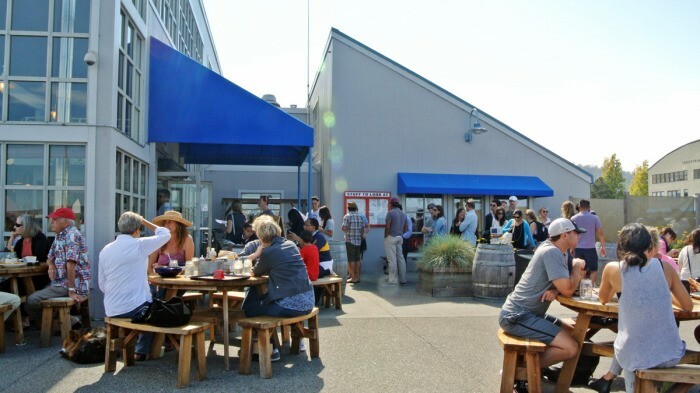 When I get a particularly warm and sunny day, nearly every time I just want to be outside to enjoy some fresh seafood with a cold beer. Since we have a car, taking a short drive north over the Golden Gate bridge to Sausalito is not a big deal and Fish. is the perfect solution for this sunny weather scenario. Fish. 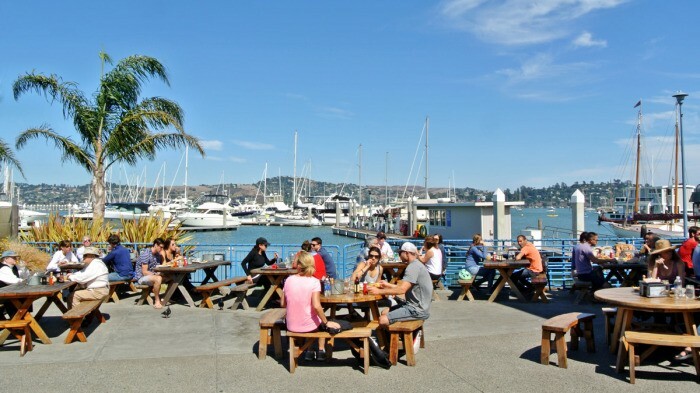 – as you may have imagined – specializes in seafood and is located in a waterfront parking lot right by the Sausalito boat docks. 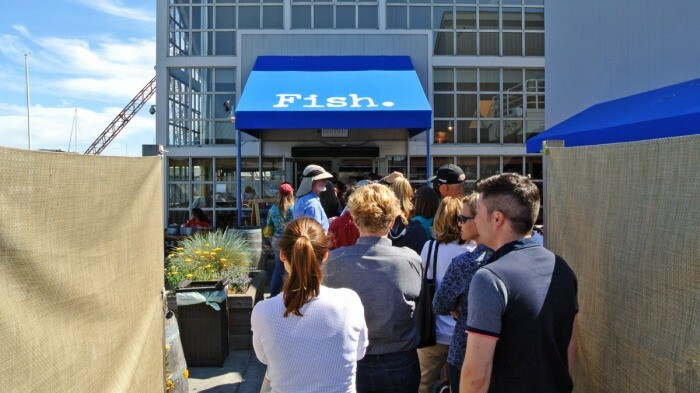 Given its prime location and reputation for high quality seafood, it was no surprise to find a long string of people lined up out the door. Yes, the line was actually quite long and it probably took about a half hour to reach the register and place our order. But, we were quick on our feet and sent two representatives up to the bar inside to load up on beers to drink outside while we waited. I hate waiting in lines, but it wasn’t so bad with a great beer in hand and the sun on our faces. 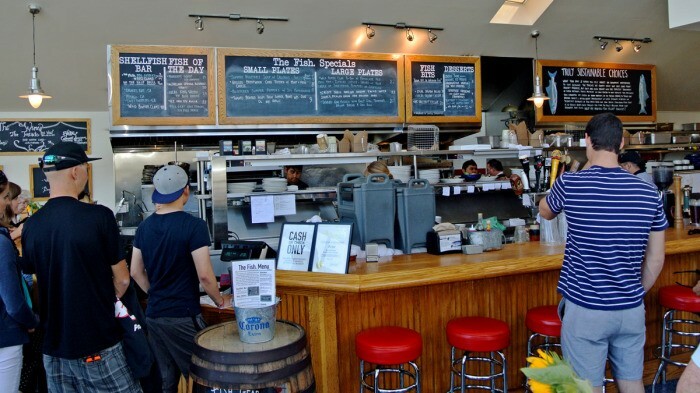 While I was up there grabbing a beer, I noticed signage explaining that all of their seafood was sustainably sourced similar to the care taken for the sushi over at Tataki in Lower Pac Heights. With the responsibly selected and sourced fish, I’m sure it’s no surprise that prices were not particularly cheap at Fish., but I like to think that taking care of the aquatic ecosystem will be worth it in the long run. Once we reached the front, we placed our orders and found an open table outside to plop down at while our food was prepared. The first dish to arrive was The Fish. Ceviche which was extraordinarily delicious. You could really taste and even feel the quality of that carefully-prepared, fresh, citrus-marinated white fish. The portion was quite generous and the freshly-fried, salty tortilla chips paired with the limey seafood salad extremely well. 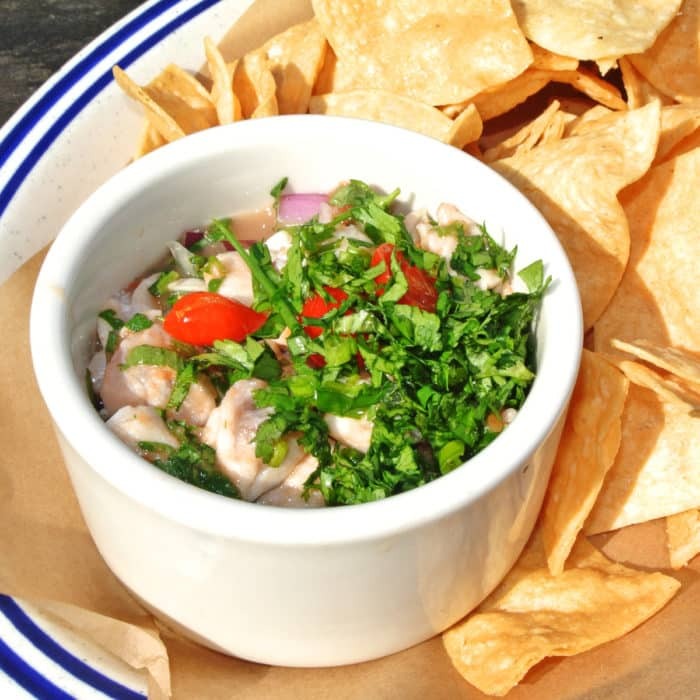 As a ceviche lover, I was more than satisfied with this rendition. We’ve been on a real shishito pepper kick recently, so that’s what was up next even though the starter involved no seafood. 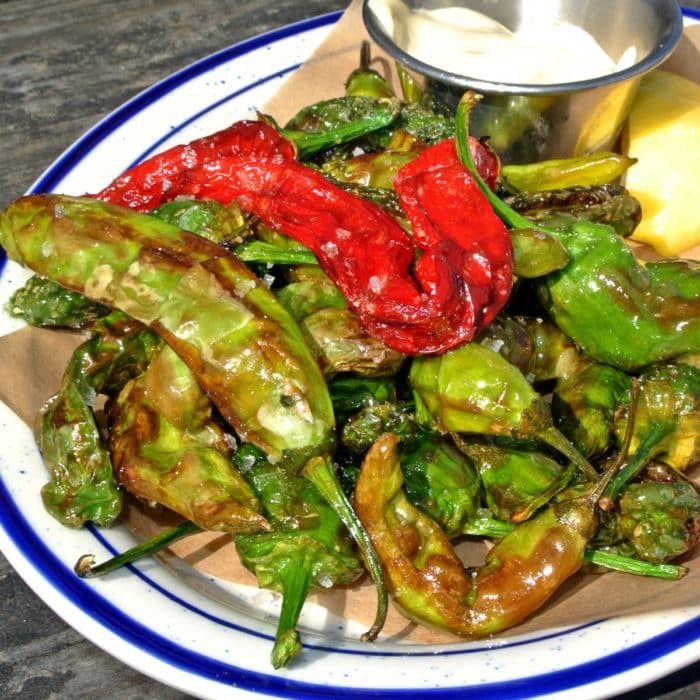 Those Blistered Summer Peppers were very fresh and excellent – just like I’ve come to expect and appreciate about all of the local produce in the Bay Area. As usual, eating a bowl of these peppers is a bit like playing Russian Roulette. Most are mild but every now and then you’ll get a super-hot one. In this batch, we had a relatively high percentage of super-spicy surprises so we left this dish with pretty scorched mouths. They were salted well, blistered nicely, and were particularly delicious when dunked in the creamy and spice-soothing soy mayo dipping sauce. As Amy’s main, she went for the Fish. and Chips which at $24 was by no means cheap. 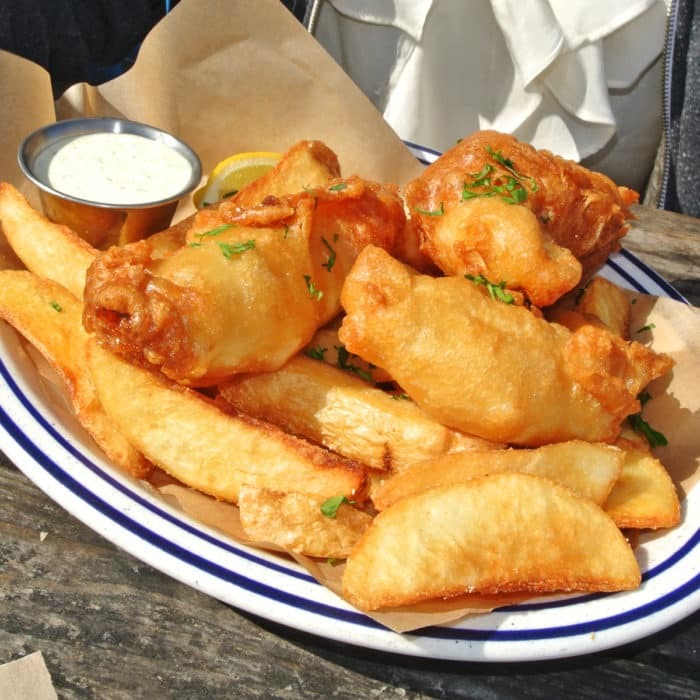 But, in my opinion it was totally worth the cost because the platter of fried fish utilized extremely high-quality Alaskan Halibut and was perfectly executed. The fish inside was soft, tender, and flaky and miraculously wasn’t a destroyed mess after deep frying like most battered and fried fish so often becomes. And that battered exterior was really well-done too. It was light and airy, but also was bold, flavorful, and crispy. They did a hell of a job beer battering that extraordinarily fresh Alaskan Halibut and all it took was a little drizzle of malt vinegar to make it truly perfect. To quench my seafood craving, I went for the much talked about Crab Roll. Dungeness Crab is a Bay Area specialty so I had a good feeling about getting an enormous hero sandwich loaded with the stuff. It’s definitely a smarter decision than ordering a Lobster Roll in a part of the country that doesn’t actually have lobsters like I did previously in Los Gatos. 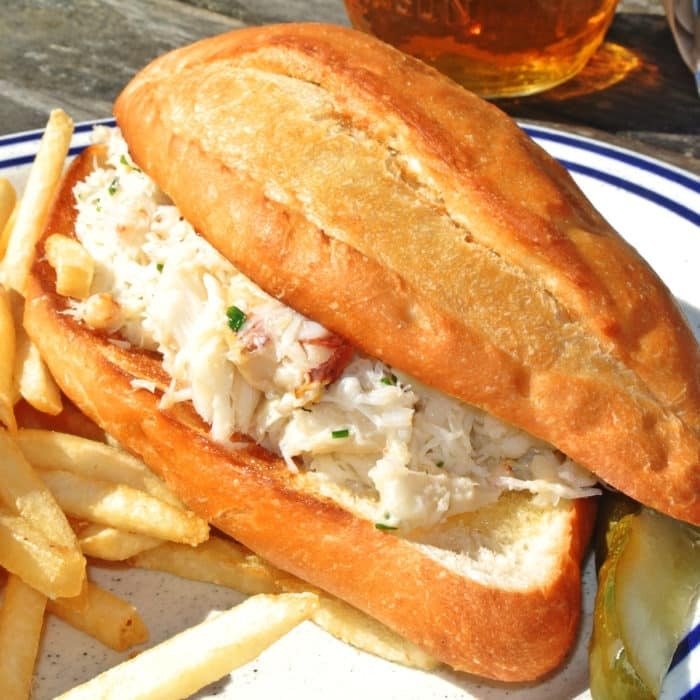 The sandwich was massive and was utterly overflowing with shredded dungeness crab meat. The meat was delicate and sweet and the proportions of the sandwich really highlighted the featured ingredient well. The sliced baguette and was also quite nice and had a soft, fluffy, well-buttered interior that really held the whole thing together well. All in all, this dish was just outstanding. 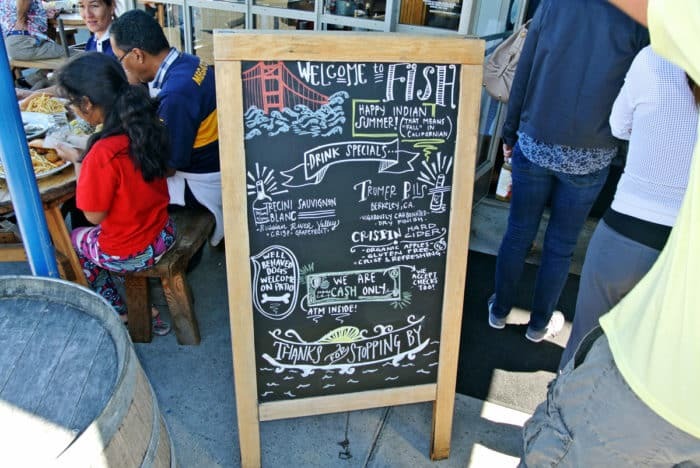 So if you’re in the Bay Area and get the same urge to eat seafood outside on the waterfront as I do, do yourself a favor and head up to Sausalito to Fish. It’s certainly not a cheap way to quench the craving, but when you’re paying for such high quality and freshness, you won’t mind it one bit. The quality and care really shows in every one of their dishes. 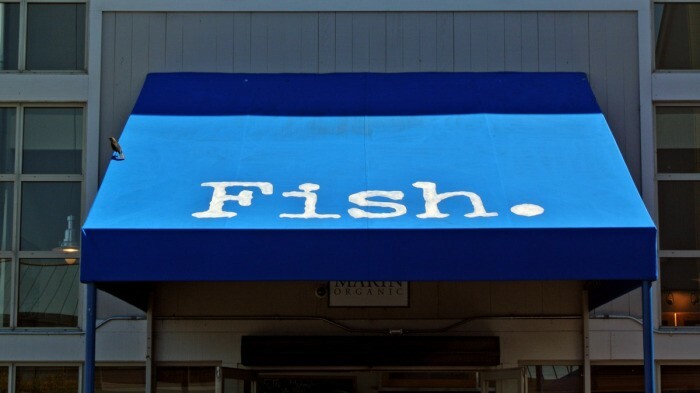 Got another killer seafood spot in the Bay Area I should check out? Let me know in the comment below.